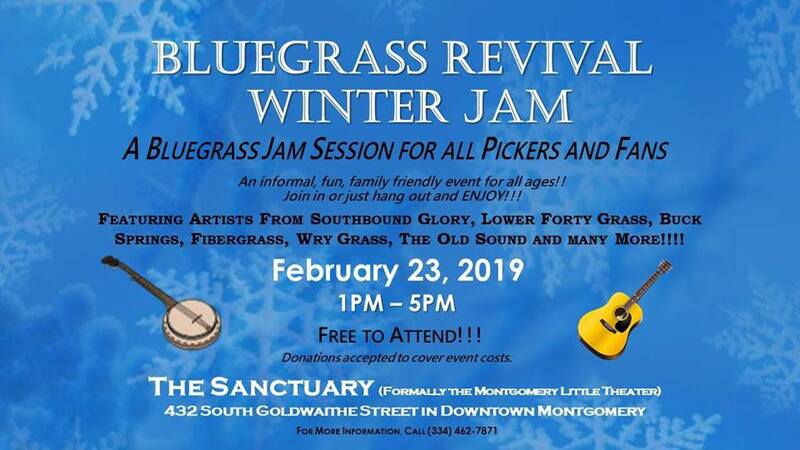 Mark your calendars now for the Bluegrass Revival Winter Jam, February 23, 2019, 1-5pm, at The Sanctuary, 432 South Goldthwaite Street in the Cottage Hill area in downtown Montgomery, Alabama. Come join in a play along with some of the area’s greats or just come hang out and listen to some good ole bluegrass music. This will be an informal, fun, family-friendly event for all ages. Everyone and all skill levels are welcome!! For more information, call (334) 245-4546.